Date: 30 September 2016. Cup-holder Repair. One of my first purchases for Seaweed in the line of decadence enhancement was a cup-holder. It was one of those fancy ones that remains level when the boat rocks. My caffeine would be safe while underway. After years of use however it broke. This is how I fixed it. It all started back in 2008 when I bought my home. I knew the importance of staying well hydrated while on the water. Drinking is important. When running Seaweed I wanted to make sure that my cup did not go flying when the boat rocked. In Jacksonville there is a store called Pier 17. I'd been in that same business many times fifty-plus years ago. Visiting Pier 17 was a given each time we came through Jacksonville on our 40'er. Daddy and I would go and I'd wander around. The owner and Daddy would smoke their pipes and solve all the world's problems. When I rediscovered Pier 17 after so many decades I had to buy something. In addition to my first anchor (a 16 pound Hydro-bubble) I bought a fancy cup-holder. Life was good. The cup holder was great. For a few years it was inside Seaweed and hung by the steps into my forward cabin while underway. Later I moved it into the dinghy Algae. The cup holder is behind me and just forward of my left elbow. Having a cup holder in the dink was handy. I loved the convenience of having a place to put my glass where it would not spill. Skipper gets enthusiastic when we are riding in Algae. With my cup in the holder I didn't worry about spills. 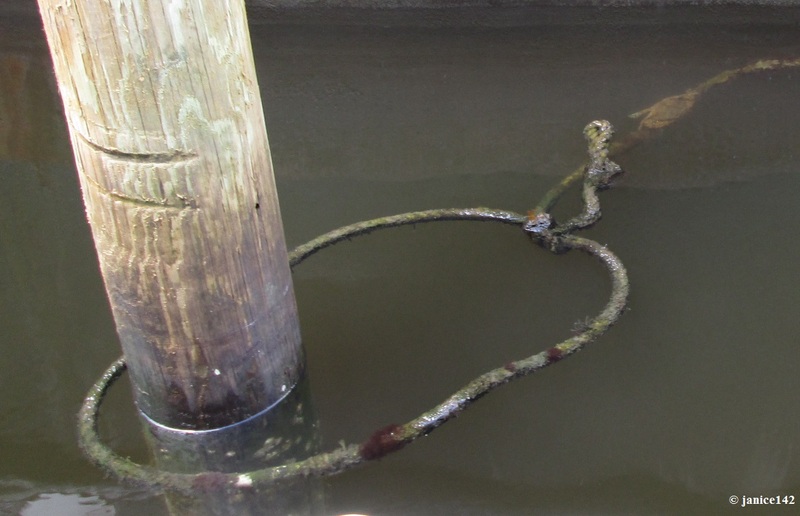 One day we spotted a blue crab hanging on an old rope by a piling. Going slow I have the opportunity to really see the world. It's a beautiful place. 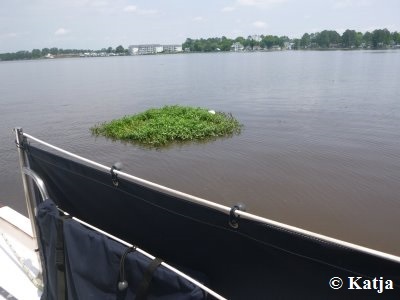 There is nothing better than hopping into Algae and turning on the trolling motor for a spin about an anchorage. Electric trolling motors are quiet. Skirting the shore we spot lots of wildlife that would have been scared off by a noisy outboard. It is one of my favorite things to do with Skipper. The cup-holder is not designed for long term use outside. Eventually the metal basket part failed. The cup-holder lasted three or four years in Algae. That is a salty environment. I should have removed it from the dinghy when not in use. On the other hand I did get my $10's worth from the product. When the basket finally gave up the ghost I was of course disappointed. I should have taken better care of it. I threw away the broken basket and decided to figure out a way to fix it. In the meantime I always follow the *SSCA mantra of "Leave a clean wake". That means I keep whatever is in my vicinity pristine. Trash does not float by Seaweed! 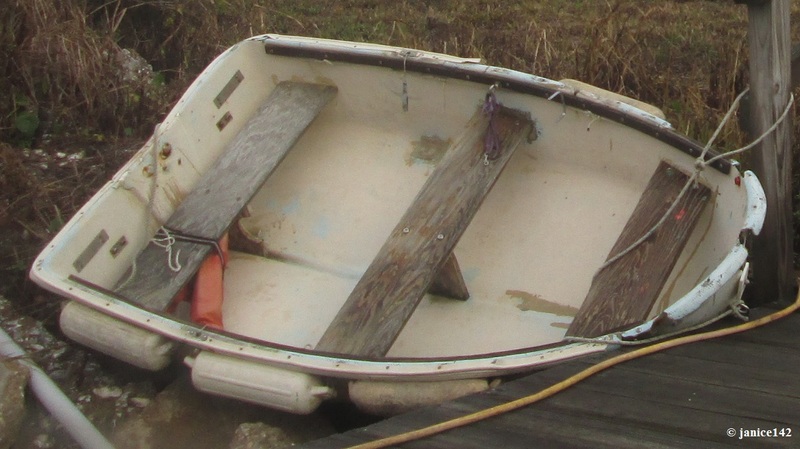 I retrieve it for disposal ashore. *SSCA: The Seven Seas Cruising Association [http://ssca.org] From their website, "Founded in 1952, SSCA is one of the oldest and largest organizations of cruisers in the world. The goals of the original six founders are still the goals of SSCA today: to share cruising information and camaraderie with fellow cruisers, and to leave a clean wake for those who follow." When I spotted a blue cup floating by the transom of Seaweed I got it out of the water. After cleaning the plastic cup I noted the size looked just about perfect for the cup-holder in Algae. 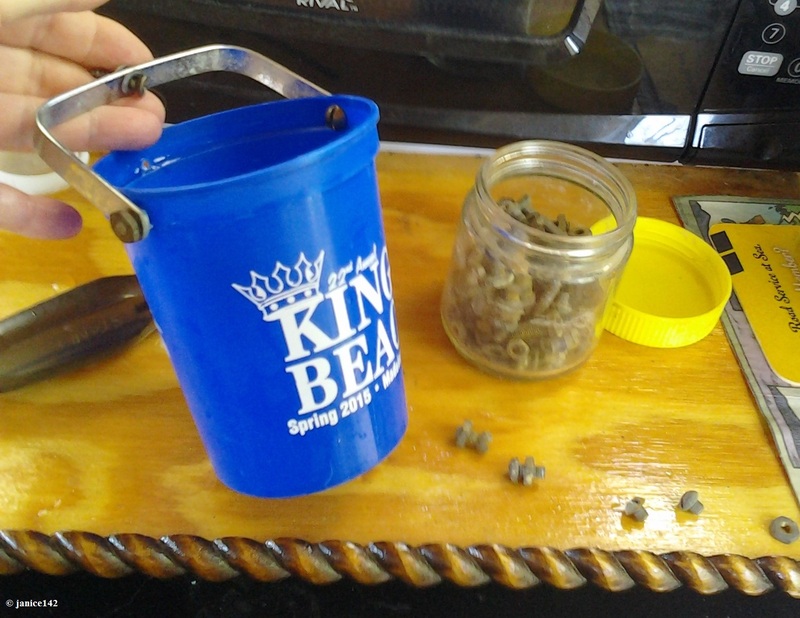 I attached the blue cup to the frame of my cup-holder with nuts and bolts. For those interested, I used short 8x32's. A brief lesson in bolts can be found in the Bolt Sizing Primer vignette. I drilled holes in the sides and back of the cup. Later I realized the one I drilled in the back was unnecessary. It always pleases me to save money. Though I probably would not have spent another $10 to put a cup holder in Algae I admit I missed it. 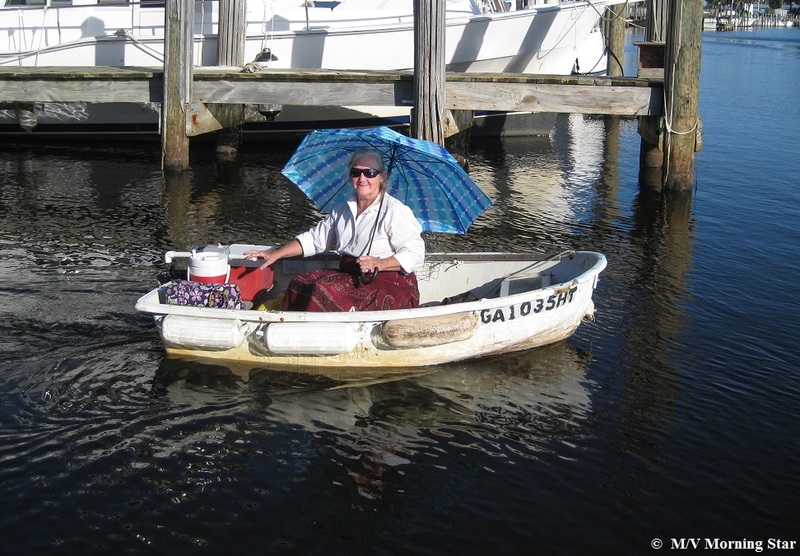 Skipper and I like going for boat rides and having a place to put my drink is convenient. #1) The screws cannot protrude too far into the cup or your glass won't fit. Check the size of the screw heads before you start. #2) Be sure to flip the cup upside down when not in use or it will fill with water when it rains. Side Note: I chose not to drill holes in the bottom of the cup. In an emergency I could use the cup for a bailer. Also it would work as a drinking cup for my Skipper or me if needed. #3) Here in the south figure on replacing the cup every four months. The sun will dry out the plastic. The plastic will crack. A better quality cup should last longer. For me Good Enough is quite sufficient. Plus the cup was free which is the perfect price. There are wooden supports around the *gunnels of Algae. The wood is a perfect place to screw stuff. One screw and voila, instant happiness for me. My pint ice tea glass fits perfectly. *Gunnels are the top edge of the hull. 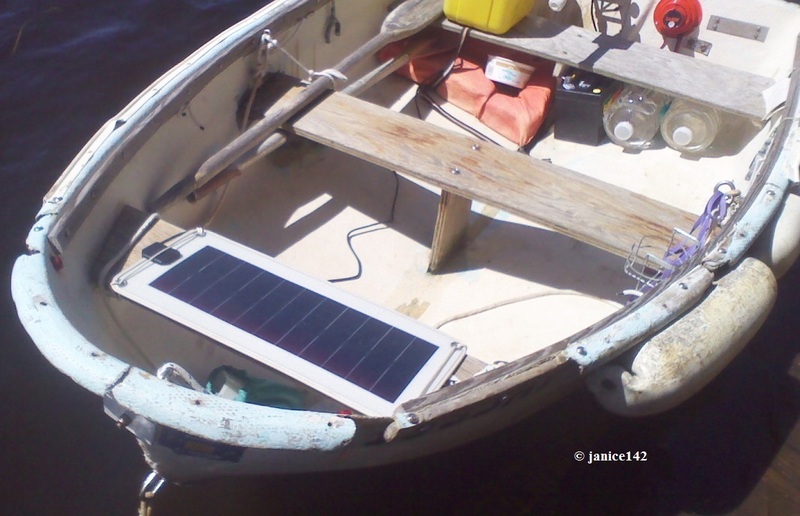 "Over the gunnels" is a bad thing as you're getting water in your boat. Now I know the sun will deteriorate the plastic and this will be an ongoing repair process. Fortunately it is a simple one. From start to finish the job was completed in about a half hour. That works for me. Best of all, the next cup replacement shouldn't take more than about ten minutes as I've already got the hardware and plan in place. Have you installed a drink holder in your tender? 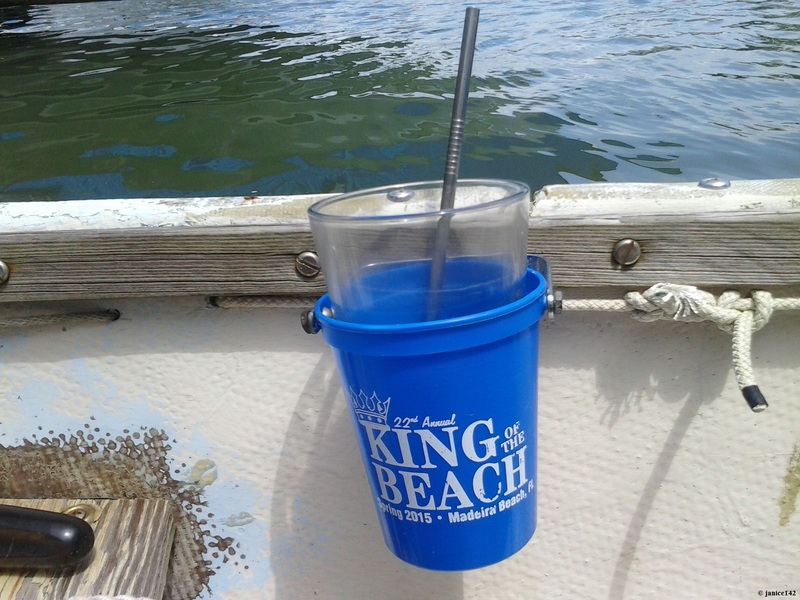 Do you use a cup-holder in your main boat? Aphorism Alert: In order to discover new lands, one must be willing to lose sight of the shore for a very long time. Andre Gide.